» Can Desperation Save the Dying Yankees? Can Desperation Save the Dying Yankees? Let’s start with some questions: Is it just bad luck that so many god-awful playoff performers found themselves playing for the New York Yankees? Does a lack of clutch hitting have something to do with attitude? Is it contagious? Is it Joe Girardi’s fault, somehow, for fostering a tense atmosphere just by projecting an anxious personality? Has A-Rod poisoned the well? How can so many players who make so much money and score so many runs together during the regular season suddenly look like terrified third-graders at their first piano recital? Second, a hypothesis: For overall quality of offense, taking both the Yankees and Orioles into account, this has to be one of the worst playoff series ever. Consider Baltimore. Their fans did not react kindly when I compared the Orioles to a “little brother,” but like it or not, that’s exactly how they’ve played. In four games, they’ve managed just nine runs. In their losses, they’ve gone 2-14 (.143) with runners in scoring position. In their wins, they’ve gone 4-17 (.235). Adam Jones, their best hitter in the regular season (after Nick Markasis went down, anyway), is 2-19. Matt Wieters, their second-best player by offensive Wins Above Replacement, is 2-17. Mark Reynolds is 3-18. So is J.J. Hardy. Jim Thome is 1-12. Manny Machado is 2-14. The whole damn team is batting .197! That’s like having 2012 Carlos Pena at every position, one through nine, except with almost no power. On top of that, their closer has blown one save and failed to maintain a tie in another game by giving up a home run to the Yankees’ worst hitter. Aside from his plate struggles, Jones may have cost his team a win by misplaying a fly ball in center field. Ryan Flaherty dropped an easy pop-up in Game 4. They even lost in extra innings, which hadn’t happened in 16 games. With all those facts stacked against them, you’d think the Orioles would have suffered an embarrassing sweep. And yet, unbelievably, it’s the Yankees who are lucky to be alive. When I talk about the Yankees, it’s very difficult not to put a profane adjective in front of their name. The experience of watching this team in the playoffs is 90 percent rage, 5 percent triumph, and 5 percent extreme, terrifying rage that makes your spouse leave the room in a combination of annoyance and shame. There’s no joy involved. Toward the end of Game 4, as the Yankees blew another inning with a display of abysmal pressure hitting, even by the low standards of a franchise that has been miserable at pressure hitting for the past nine seasons (2009 excluded), I realized that I wouldn’t be happy even if they won. It reminded me of playing darts with someone who, like me, isn’t very good. In the darts game “cricket,” you have to finish by hitting the bull’s-eye at least once, and if neither player has any skill, it can take forever. After 20 or so turns, any notion of one player coming through in the clutch evaporates into a monotonous stalemate, and everyone just wants the game to end. When one player finally hits that winning bull’s-eye, there’s no celebration. Someone just says “Finally,” and then you go off to play a better game, like Ping-Pong. Watching the Orioles and Yankees fight for that winning run in Game 4 was somehow even less appealing than watching two drunk hacks throw darts for an hour. For one, there was no Ping-Pong option. But here’s why it was worse to root for the Yankees in that situation — your guys are supposed to hit. Not that Baltimore’s lineup is staffed with easy outs, but their contracts and reputations pale in comparison, and if they struggle to score runs, well, it’s not that surprising. 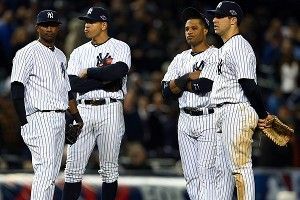 In fact, they were ninth in scoring in the American League, almost a full 100 runs behind the AL East–leading Yankees. So let’s talk about the Yankees hitters. I put three players on playoff choke alert a week ago, but it turned out I was not nearly comprehensive enough. I gave Robbie Cano a pass considering his recent hot streak and the fact that he’d performed decently the past two years, despite the fact that he’s always in danger of reverting to a flailing ground-out automaton under pressure. I also failed to anticipate how poorly Granderson would perform. But the numbers … oh man, the numbers. Even if I give Martin a pass for his critical home run in Game 2, that’s six regular starters who just can’t hit. At all. The numbers actually make them look less hopeless than they seem in the actual game. Michael Kay put it best on the YES postgame report last night when he said, “There are just too many landing spots for pitchers.” As a fan, you find yourself writing off entire innings when the due-up batting order is something like Cano-Rodriguez-Swisher. And what’s crazy about all this is that Mark Teixeira, the current Yankee best known for poor playoff performances, is playing really well! Everyone else, besides the irreproachable Derek Jeter and role players like Raul Ibanez and Jayson Nix, is a disaster. It’s a really awful feeling as a fan when you expect your team to fail, especially with runners in scoring position, and then it happens. It’s like watching a family member disappoint you over and over again. In the eighth inning last night, when a run would’ve put the Yankees three outs from winning the series, Ichiro and Teixeira led off with base hits. With two men on and none out, the next three batters due up were Cano, A-Rod, and Swisher. My friend Josh and I had the same thought at the same time: This inning’s over. WITH NONE OUT! Cano grounded to second, and only the slow speed of the hit ball kept it from being a double play. With runners on second and third, when even a weak grounder might have produced a run, A-Rod struck out on two fastballs that topped out at 85 mph and a slider that broke about a foot off the plate. Swisher ended the inning with a lazy fly. As usual, no runs crossed the plate. Let’s talk about Joe Girardi. In the ninth inning Wednesday, he sent Ibanez in to pinch hit for Rodriguez. The move seemed almost revolutionary, despite the fact that if you were watching A-Rod’s performance in a vacuum, it would seem obvious. A-Rod can’t hit, so sub him out. Easy. But that ignores the fact that A-Rod is one of the greatest ballplayers of his generation, and one who happens to have a fragile ego and a longstanding reputation for choking under pressure (again, with the increasingly inexplicable exception of 2009). Benching him or demoting him has psychological implications that go beyond the mere move, as Joe Torre found out in 2006 when he moved him to eighth against the Tigers. It created — or at least solidified — a permanent rift between the two, and Girardi seemed to hearken back to that famous incident when he admitted to reporters that there’s an emotional component to the decision that can’t be explained in numbers. So it was a brave move to send Ibanez to the plate, even if it didn’t read that way on paper. And it turned out to be the right move, too, when Ibanez crushed a home run to tie the game and then hit another in the 12th inning to give his team a walk-off win and a 2-1 series advantage. Girardi called it a “gut feeling,” and for him to obey his gut is somewhat uncharacteristic. I’m one of the many people who poke fun at him for his rigorous adherence to the infamous binder that lists historical matchups, or his almost-neurotic habit of changing pitchers with unusual frequency to gain slight situational advantages. He reverts to numbers under pressure, and there are far worse ways to operate a team. But a gut call? As far as any of us knew, the only thing in his gut was an ulcer or two. But reverting to instinct was necessary on Wednesday. It was the difference between playoff life and death, and sacrificing emotional needs gave the Yankees a lifeline. There are weaknesses to this approach, notably putting the defensively challenged Ibanez in left field. It doesn’t address Cano, whose incredible end-of-season hot streak vanished the minute the playoffs began. You have to leave Ichiro in despite his struggles, or the outfield becomes a complete disaster. And starting Brett Gardner, who has had exactly seven plate appearances since returning from an injury that kept him out for more than three months, is admittedly a bit radical. But then again, what the hell? Why shouldn’t Girardi be radical? Desperate times call for a desperate manager. Does anyone really believe that A-Rod, Granderson, or Swisher will come through? Has anyone watched their recent at-bats and concluded that they can be redeemed before 2012 is over? Why let them sink an entire team? It would be easy for Girardi to keep things as they are and fail. He would not be the culprit; his players would rightly take the lion’s share of the blame. Unprecedented changes in such an important game come with their own implied consequences, and they are ugly. If he opts for a lineup similar to the one above, he will raise eyebrows, bruise egos, and make himself vulnerable to harsh criticism. And if he doesn’t, he’ll simply lose.